Dear Gillian: Whose advice do I trust? OK, let’s embark on this meta journey: advice on advice. The first thing I did upon reading your letter was to consult the great Oracle at Delphi. The mystical prognostications of the Oracle at Delphi held great sway in the classical mythology and literature of Ancient Greece and early Rome. Those of the ancient world would come to Pythia, the priestess of Apollo, for prophecies and questions about the future. The Oracle touches the lives of towering literary figures from the murderous and incestual prophecy of Oedipus, (kills his father, marries his mother) to the epic heroes Achilles and Odysseus. The Oracle worked herself up into a mystical frenzy in contacting the godly realm to divine her prophecy for you. The Oracle emerged to offer simply this: “no one was wiser than Socrates.” So if the psychics weren’t doing it for you, maybe sit down with a philosophy professor or two in Angell Hall. But be careful, philosophy tends to answer questions with questions, as Socrates was known to do. This will either take your advice addiction to a whole ’nother level or it will cure you of it for good. Religions across the globe are full of advisors and seers. Prophets in the Abrahamic religions serve as middlemen between God and mortals, dispensing what amounts to advice. Joseph interprets his dream to prepare the Pharaoh and the Egyptians for years of drought and famine. For you, Ad, I chose a random minor Biblical prophet, figuring he might have time on his hands to deal with your situation. Jonah was asked by God to go give advice to the Ninevites to repent or be destroyed, but he wants nothing to do with it. He tries to escape his task, gets swallowed by a sea monster and saved by God, and then gratefully heads to Ninevah, where his prophecy saves the day. Jonah offers to you this suggestion: “Compare the advice you have received with the advice you have followed.” I’m not sure what this means, but if it helps, let me know. In the Vedas texts and Upanishads of Hinduism, we see early references to gurus: literal and spiritual teachers who counsel people, help mold their values and help them find the path. In the Sikh tradition, Guru Nanak drops some hymnal knowledge: “Truth before me, Truth throughout Time, Truth here and now, Truth is evermore.” Got that? All good? Yoruba priests in Africa imagine two parts of the cosmos: “aye,” the visible, tangible world of the living and “orun,” the spiritual world of the ancestors, gods and spirits. The priests communicate with the spiritual world as a source of wisdom and interpret the significance of the signs they receive for individuals or communities. Listen for the rustling of leaves at night because there’s truth in the spirits that move them. In the Shakespearean tradition, soothsayers predict the future and serve as dramatic plot devices. In “Julius Caesar” the soothsayer delivers an omen and speaks the badass line: “beware the Ides of March.” The characters don’t pay much attention, but the words alert the audience and raise the question of fate. Could it have been altered? To you, this same character soothsays to “Beware the Ides of April,” which is either the date of your Econ final or the day your tax returns are due — either way, solid advice. By this point, the one thing that should be clear is that not everyone — and surely not Dear Gillian — can be trusted for good counsel. Oftentimes people in your life have their own interests or are so embedded in a societal system they can’t give objective advice. Your friend who’s tryna turn up might not be the best advisor on whether you stay in and catch up on sleep or go take a pickleback at Mash. In Balzac’s 19th century novel “Le Pere Goriot,” Rastignac, a young law student from the country, tries to tap into Parisian high society. He takes advice from corrupt neighbors and acquaintances who push him toward callous social climbing informed by the ethos of the city, rather than by genuine concern. You ultimately have to mediate your intake of counsel. The early 20th century advice scene took a break from divinely sourced prophecy and was instead an era influenced by Freud’s psychoanalysis. Here, the objective is not prescriptive but analytic: you need to uncover repressed elements of your self that may help you understand your internal desires and determine what course of action suits you best. Inspired by this revelatory elevation of the subconscious, Surrealist artists used various techniques to bring it forth. 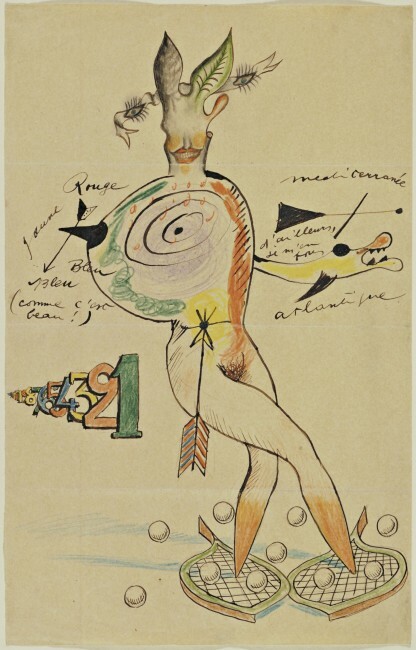 Exercises such as creating an “exquisite corpse” where multiple artists collaborate on a rendering of a human body, like this one done by Yves Tanguy, Joan Miro, Max Morise, and Man Ray from 1926-27, allowed surrealists to transcend the rational mind. Martha Graham dug down to find the subconscious or “inner landscape” embodied in movement. She believed emotions not easily expressed by words could be communicated through dance: contractions and releases. Her choreography in “Lamentation” is rich with emotion and the corporeal representation of grief. Sometimes your body can tell you more than your mind and will give you signals to how you feel about a certain situation or decision. Not that there’s anything wrong with advice, counseling or therapy, from whatever trusted source. It is time well-spent. The reality is that most people feel overwhelmed at some point and need to vent the anxieties of our modern lives where we’re blessed with too many opportunities and too much time for self-reflection. Plus without it, we wouldn’t have those satirical Woody Allen scenes or New Yorker cartoons. The parodies are entertaining, but also comforting in a sense. I’d love to know how your modern-day psychics compare with the oracles, priests, gurus, soothsayers and prophets; but friends, sisters, therapists and academic advisors can only go so far. As I believe the arts are the fountainheads of powerful wisdom, AA, find a book, film, museum exhibit or performance that deals in some way with your dilemma du jour, and you’ll be surprised how the same human heartaches recur and recur with creative solutions in the archives.